Leafs Nation has high hopes for Morgan Rielly, as they should. Recently, there was a post written by Andrew Berkshire on the question: is Morgan Rielly trending to be a No. 1 defenseman? I agree with his conclusion that he's close with some flaws, and that it may not be a question of whether or not he can be that top-pairing defenseman much longer. @JPNikota @ryanfancey I see him at this point as turning into a kind of Keith Yandle. Great offensive d-man who doesn't do heavy lifting. Horachek wants Rielly to model himself to a degree after Yandle, OEL: "They’re very mobile coming across the blue line & getting shots thru"
The first question is, obviously, are you okay with that being Rielly's ceiling? We're not asking the opinion on Keith Yandle, let's assume that draglikepull's assessment of Yandle is exactly what the ceiling is. A "great offensive d-man who doesn't do heavy lifting". Heavy lifting, meaning: tough minutes, battles in front of the net, and other elements of defense that involve excelling at play in your own zone, where Rielly has notably struggled. Not meaning: his deadlift max. I would be satisfied with that, assuming the Leafs defense can build around it. Adding players who can do that heavy lifting is key. Finding the Jake Muzzin to his Drew Doughty, the Mark Giordano to his TJ Brodie, or the Derek Morris to his Keith Yandle. The good news is this comparable is really easy to analyze. We have data for Keith Yandle's play during the time he was the same age as Rielly is now. So, let's compare them! Let's start off with some simple* charts. There's no y-axis numbers because I normalized some of these stats so you could see them all on the same chart. The difference between 0.7 PK TOI/G and 0.1 PK TOI/G is somewhat significant, but impossible to see on a graph that's also comparing 62.5 CA60 vs. 56.6 CA60. So these bars are relative to their grouping only. The actual data can be found here if you're curious. The big and most stark contrasts are counter-acting. 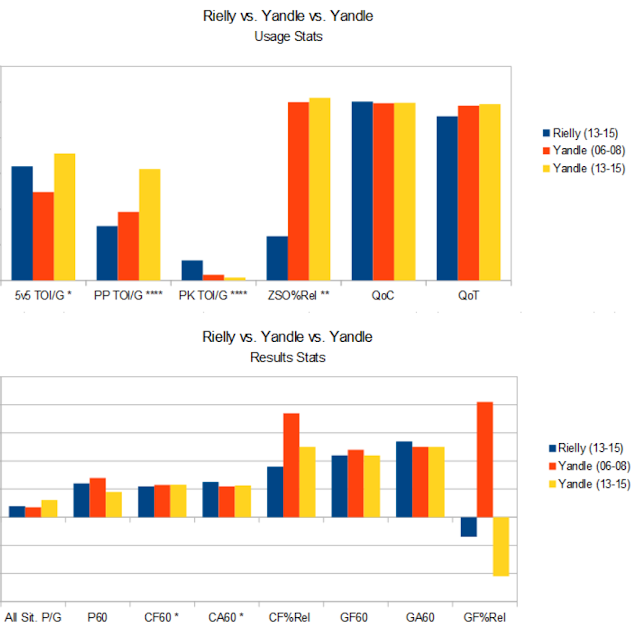 Rielly's usage was tougher — harder zone starts (ZSO%Rel), better quality of competition (QoC) and worse quality of teammates (QoT) — than Yandle's, and his results were worse — lower possession rates (CF60, CA60, CF%Rel) and production rates (P60, GF60, GA60, GF%Rel). One could easily make the connection that his usage caused his results to suffer, however I'd estimate that they wouldn't have as large an effect as what were seeing. This is especially the case in the CF%Rel statistic, arguably the most important metric shown. Well, it suggests that Rielly isn't quite as good as Yandle was when they were the same age. The difference is considerable, but partially explainable. How can we take this further? I decided to look at WOWY statistics to see if we could get a better look at whether Rielly is that much worse than Yandle was at the same age. Below is a list of players that each player spent a significant amount of time with. The numbers in the middle are a differential measure of CF% — the difference between (subtraction of) their CF% with Yandle/Rielly and their CF% without Yandle/Rielly. I added the colours to illustrate what's good/bad and how good/bad it is. A couple notes before we draw any conclusions from this. Firstly, this is for the 14-16 seasons for Rielly and the 07-09 seasons for Yandle, so Rielly's sample size is about 40 games smaller. Secondly, the outlier on each side is Hunwick and Morris, which is explained by each of these players spending only one season on the same team as Rielly and Yandle, respectively, and the other season with very good Rangers and Bruins teams. Thirdly, it's kind of funny how we see Daniel Winnik show up on both lists. Now, what do we see? That Yandle was having a significantly more positive effect on his teammates than Rielly is. Seeing numbers like 8.1 and 6.8 for Yandle are huge positives in his direction. From what we've seen here, would you say Yandle is even a fair comparable for Rielly? We started off not quite sure if Yandle was a good enough comparable for Rielly. I think we're finishing off not quite sure if Rielly is good enough to compare to Yandle. Only time will tell of course, but Rielly's ability to control the play needs to grow substantially if he wants to one day have as positive an impact on his team as Keith Yandle does.